You plug your iPhone into your computer, ready to sync but the little icon doesn’t appear in iTunes’ toolbar, and you’re flummoxed. Here we have few possible solutions to fix this issue. Restart your computer as well. Try another USB cable, or another USB port on your computer. Plug it directly into your computer instead of a USB hub. You never know when you have bum hardware, and no amount of software troubleshooting can fix that problem. With any luck, one of these simple tricks will fix the problem. But if not, read on. When you plug an iPhone or iPad into your computer for the first time, a message will pop up on your device, asking whether it should trust the computer it’s been plugged into. 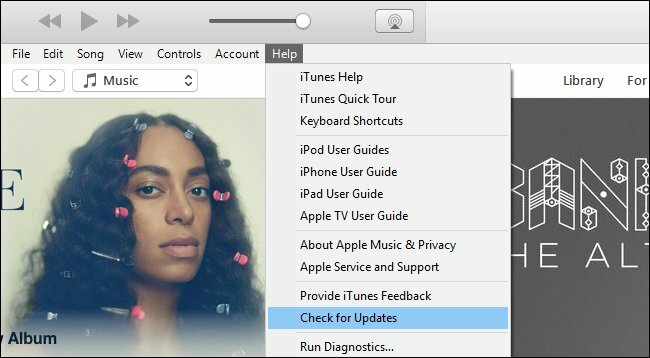 If you aren’t paying close attention, it’s easy to miss–and without responding to that prompt, your device won’t show up in iTunes. Even if it isn’t the first time you plugged your device in some settings may have been reset, and you’ll need to respond to the prompt again. So check your device and see if the message has popped up. Tap “Trust” to continue. If you ever pressed “Don’t Trust” by accident, your device won’t show up in iTunes and the message won’t pop up again. Thakfully, there’s a way to fix this. This is stored in the “Location & Privacy” settings in iOS. 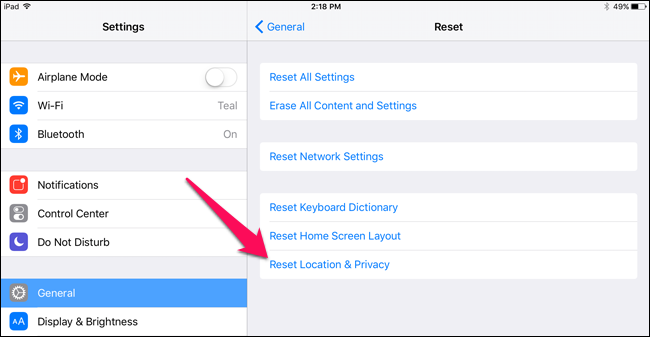 You can reset them by going to Settings > General and tapping “Reset Location & Privacy”. 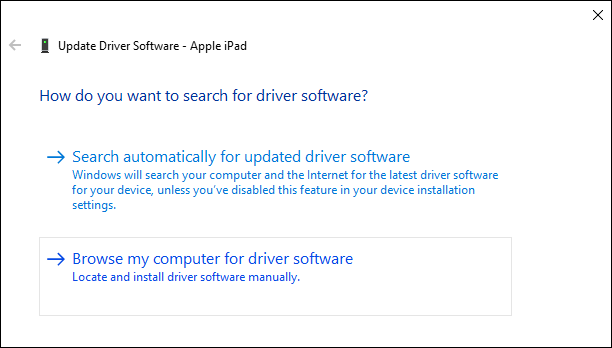 Other times, things can go a little wonky with Apple’s drivers, and your Windows PC won’t recognize your iOS device properly anymore–even if you press “Trust” repeatedly. In my most recent bout with this problem, the drivers were to blame, and just needed reinstalling. Close iTunes and plug your iPhone or iPad into your computer via USB. 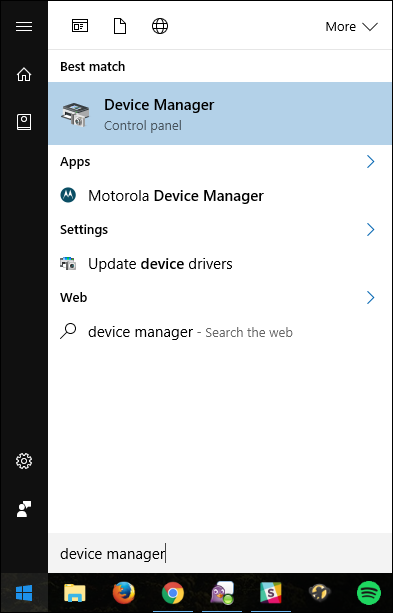 Then, click the Start menu and search for “Device Manager”. Select the Device Manager option that pops up. 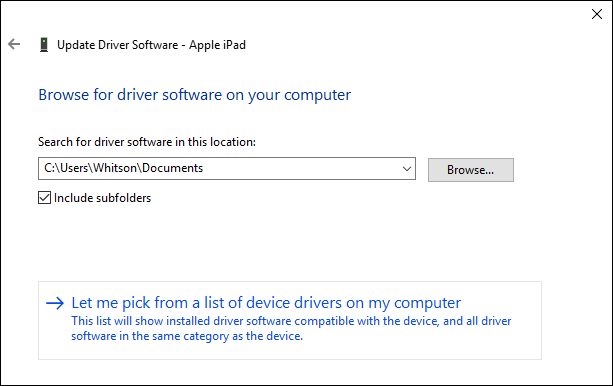 Search for your iPhone or iPad in the Device Manager–you should find it under “Portable Devices”. Right-click it and choose “Update Driver Software”. On the next window, select “Browse My Computer for Driver Software”. 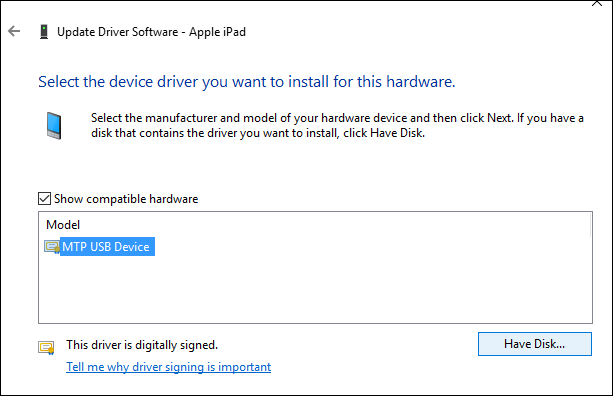 Then, click “Let Me Pick From a List of Device Drivers on My Computer”. On the next screen, click the “Have Disk” button. 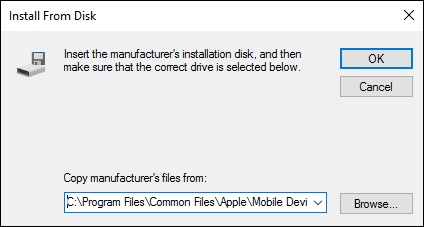 On the Install From Disk window, click the Browse button. Navigate to C:\Program Files\Common File\Apple\Mobile Device Support\Drivers\usbaapl64.inf. Double-click the usbaapl64.inf file to select it, then click OK in the Install From Disk window. NOTE: If you’re on an older 32-bit computer, the driver may be in C:\Program Files (x86)\Common Files\Apple\Mobile Device Support\Drivers instead. 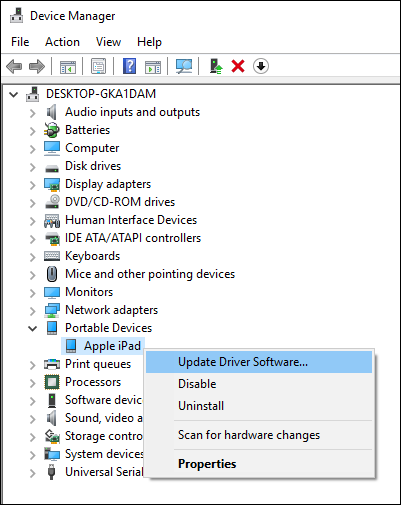 Your PC should reinstall Apple’s mobile drivers. Close the Device Manager when you’re finished and start iTunes. You should find that your device is properly recognized.